For either of these types of projects, you'll want to start with a shape or die that is relatively symmetrical. In other words, when folded, the right and left sides (or the top and bottom halves) should be as identical as possible. That's important, because you'll be gluing the left half of one to the right half of the other (or top to bottom), and you'll want to create the illusion that they are the same. When in doubt about a particular shape, just give it a try. These instructions are for the placecard holder, which means we'll be providing the numbers (copies of the same shape or assembled die cut) we needed to make the shape stand upright. 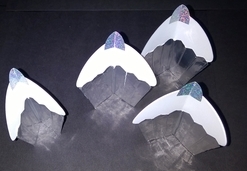 For 3-D paper embellishments, you will likely reduce the numbers to only 2 or 3 copies. The more copies you add, the fuller the shape. 1. 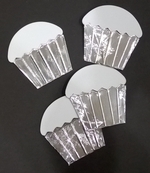 Using the Accucut die for the mini cupcake, cut 4 copies of the cupcake insert out of white cardstock. 3. 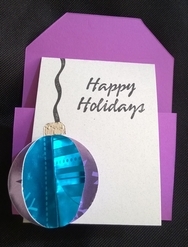 Using an oval punch, cut 2 ovals out of colored or patterned paper. Cut them in half, again, staying symmetrical, to make the "gumdrops" for the top of the cupcakes. 4. 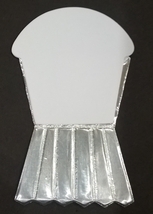 We are not going to assemble the cupcake such that the wrapper and insert can be separated (which is how you'd do it for a card). Instead, we are going to glue the whole thing together as we assemble. 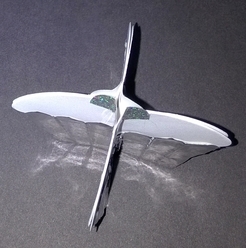 Fold the flaps on the wrapper inward and glue them down. 5. Glue the cupcake insert to the wrapper while the wrapper is still open. 6. 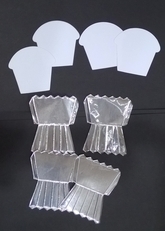 Fold the wrapper up and glue it to the cupcake insert and the rest of the wrapper. This should create a solid piece with the cupcake and the insert together. Since we used Duct tape with the adhesive side facing "in," we didn't have to use glue. We just let the duct tape adhesive do all that work for us. 7. Do this for all 4 cupcakes. You can fold them in half at this point and reopen them so you have a good idea of the center line for each one. It might make placing the gumdrops easier. 8. Being careful to line place the "gumdrop" in the exact same place on each cupcake, glue each gumdrop to the top of each cupcake. Make sure they are all at the same height and centered left to right. 10. To assemble the final project, glue all four cupcakes together, left back to right back, etc. Don't put glue on the gumdrop tops, as they need to allow a placecard to slide between them.